Delve into the incredible world of hobbits, wizards, and dragons in this exceptional visual adaptation of J. R. R. Tolkien's classic fantasy epic The Hobbit. 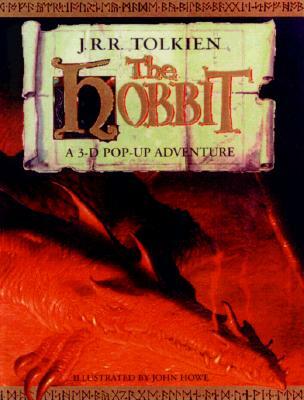 This innovative pop-up book transports hero Bilbo Baggins, a small, quiet hobbit, through five adventures from the novel. Featuring beautiful illustrations, intricate paper engineering, and pull-out scrolls with excerpts, this unique edition is the perfect introduction to Tolkien's timeless tale and a must-have collectible for Hobbit fans of all ages. John Ronald Reuel Tolkien (1892-1973) was a major scholar of the English language, specializing in Old and Middle English. Twice Professor of Anglo-Saxon (Old English) at the University of Oxford, he also wrote a number of stories, including most famously The Hobbit (1937) and The Lord of the Rings (1954-1955), which are set in a pre-historic era in an invented version of the world which he called by the Middle English name of Middle-earth. John Howe is the illustrator of a number of children's books. His artwork has been featured in a variety of J. R. R. Tolkien novelties, including New Line Cinema's forthcoming Lord of the Rings movie trilogy. Mr. Howe lives in Switzerland.